This CellML model runs in both COR and OpenCell. The units have been checked and they are consistent. The CellML model may recreate the results of the original published model but there is no simple validation method as there are no "concentration against time" figures in the paper. The CellML model is based on equations A1a, A1b, A1c, A1d and A1e from the Appendix. Parameter values were taken from table 1 in the paper and were also supplied through correspondence with the original model author. ABSTRACT: Human growth hormone (hGH) is a therapeutically important endocrine factor that signals various cell types. Structurally and functionally, the interactions of hGH with its receptor have been resolved in fine detail, such that hGH and hGH receptor variants can be practically engineered by either random or rational approaches to achieve significant changes in the free energies of binding. A somewhat unique feature of hGH action is its homodimerization of two hGH receptors, which is required for intracellular signaling and stimulation of cell proliferation, yet the potencies of hGH mutants in cell-based assays rarely correlate with their overall receptor-binding avidities. Here, a mathematical model of hGH-stimulated cell signaling is posed, accounting not only for binding interactions at the cell surface but induction of receptor endocytosis and downregulation as well. Receptor internalization affects ligand potency by imposing a limit on the lifetime of an active receptor complex, irrespective of ligand-receptor binding properties. The model thus explains, in quantitative terms, the numerous published observations regarding hGH receptor agonism and antagonism and challenges the interpretations of previous studies that have not considered receptor trafficking as a central regulatory mechanism in hGH signaling. A schematic diagram of the kinetic model of human growth hormone (hGH) receptor binding and trafficking. The extracellular ligand (L), hGH, has two sites for binding the hGH receptor (R), and these are shown in cerise and cyan in the diagram and are numbered 1 and 2 respectively. Site 1 always binds to the receptor first to form a 1:1 ligand-receptor complex (C). 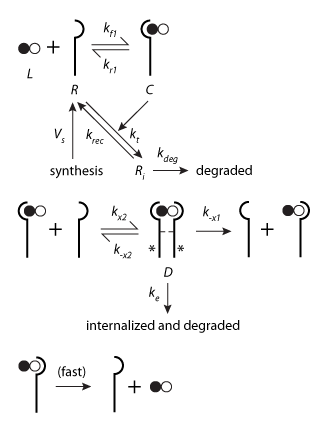 A 1:2 dimer (D) may then form through the binding of a second receptor to site 2 of the ligand. Dimer dissociation can occur the uncoupling of either hGH site 1 or site 2, but the 1:1 ligand-receptor complexes bound through site 2 dissociate much faster than those bound through site 1. Dimerised complexes (D) are internalised at a higher rate than are free receptors (R) or 1:1 complexes (C), and while internalised dimers are always degraded, internalised 1:1 complexes or free receptors can either be degraded or recycled to the cell surface. A steady state is maintained through de novo receptor synthesis.